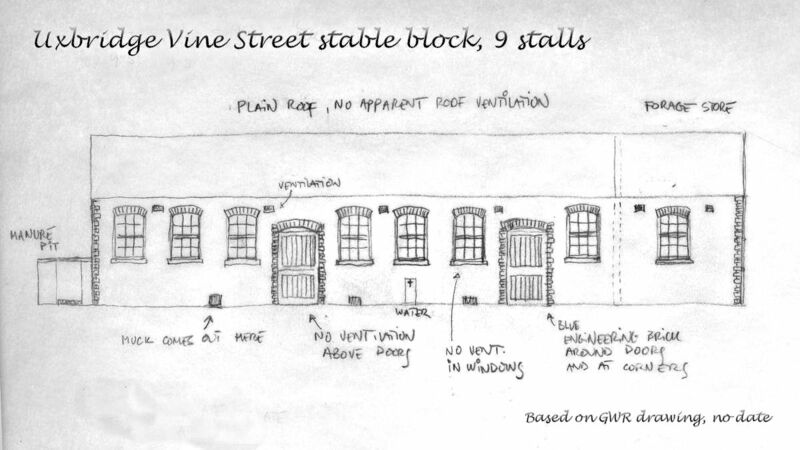 The following are my notes on GWR stable blocks – a subject that does not seem to have received much attention. I am about to build one for Farthing, and have noticed various style differences that may be of interest to others. 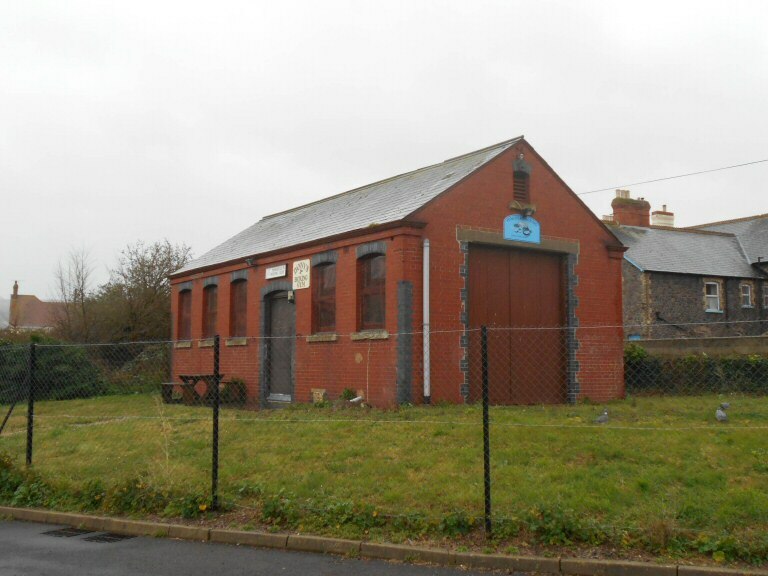 I first became interested in GWR stables some years ago, and received some very helpful advice and material over on RMweb. Many thanks gents! 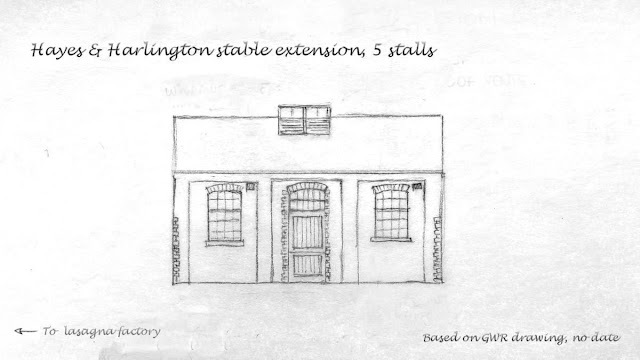 However, I wanted to obtain an overview of the designs of stables built by the GWR, and this proved tricky. While there are a number of drawings and photos in various books and line histories, I couldn’t find an actual overview anywhere (or have I missed it?). Janet Russell's wonderful "Great Western Horse Power" comes closest with a handful of selected GWR plans and descriptions, but no attempt to provide an overview of the different styles. Vaughan’s "Great Western Architecture" and Stephen Williams’ "GWR Branchline Modelling vol 2" have a few pictures and drawings each. The stable block at Uxbridge Vine Street, illustrating how stables were sometimes located well away from the center of stations. Source: Britain from above. Embedding permitted. So I have tried to make my own overview. Please note that this isn't based on extensive archival research or a systematic review of the various line histories. I have used a few key books and what others have shared. In the following I focus especially on the standard designs. Most of what I have found seems to have been built from approximately the 1890s to grouping. I have not found evidence of standard designs before this time, but that may just be my lack of information. Little seems to have been built after grouping as horses were disappearing, but many stables remained in use for other purposes long after that. Although I identify 3 main styles, there also seem to have been hybrids and possibly also “retro-fitting”. So rather than seeing the three styles as entirely different designs, it is probably better to see them as different expressions of a standard design that evolved over time. The standard designs were single-story and followed classic GWR style features, i.e. red brick structures with blue engineering bricks around doors and at corners. The main style differences were in the ventilation, windows and doors. Sizes differed widely across the same style, from a few stalls to 20+. The footprint was simply stretched in length to accommodate the necessary no. of stalls (thanks for pointing that out, Ian). They were mostly rectangular, although there are one or two examples with a V or U shaped footprint to fit in the surroundings. In the following I have used sketches of quite large stable blocks to illustrate the styles, as they are of particular interest to me at the moment - but the same styles could be found across different sizes. Plain stable doors and sash windows with 3x4 panes. Limited ventilation. No roof-mounted louvred vents, no vents in doors and windows. Examples: Uxbridge Vine Street, Castle Cary. I’m having trouble dating this style, but my theory is that it is the earliest expression of the standard designs, because it pays so little attention to ventilation. My ham-fisted rendering of Uxbridge Vine Street, illustrating Style A. An attractive option for the modeller who doesn't want to model the complicated ventilation seen on other types. Based on the original GWR drawing in Russel's "GWR Horse Power", which also has a drawing of the smaller stable block at Castle Cary to the same design. Classic boxy louvred roof vents. Stable doors have “hit and miss” vents above, while windows have the same vents below a 3x3 glazing pattern. Examples: Abingdon, Chipping Norton (see header photo), Westbury, Hayes (original), Hayle, Park Royal, Thame, Little Somerford. Again there are dating difficulties. Chipping Norton’s stable was built in 1904. Westbury was totally rebuilt in 1901, so maybe the stable is from that date? Park Royal doesn’t seem to have been developed until the late 1900s. Park Royal, illustrating the archetypical features of Type B. Stable doors have 2 rows of small windows/lights above doors, main windows are 4x5 panes. No vents in doors and windows, but large roof vents that are flatter and longer than the classic style. Examples: Weston-Super-Mare, extension block at Hayes, and the unidentified large new stable block in Russel's Great Western Horsepower p. 209-210. I’m calling this the “later” style because (i) the roof vent design seems more modern and functional and (ii) the original block at Hayes was style B design, but when it was extended (no date) the new blocks were to style C.
Weston-Super-Mare, illustrating what I call Type C. Twenty stalls is a lot, there weren't many stables this big. A much smaller version of Type C. This 5-stall block was erected to extend the existing Type B block at Hayes & Harlington. A comparison with Weston-Super-Mare shows that the style is the same, and was simply shortened or stretched according to need. One or two stables I have seen could be hybrids between the main permutations. 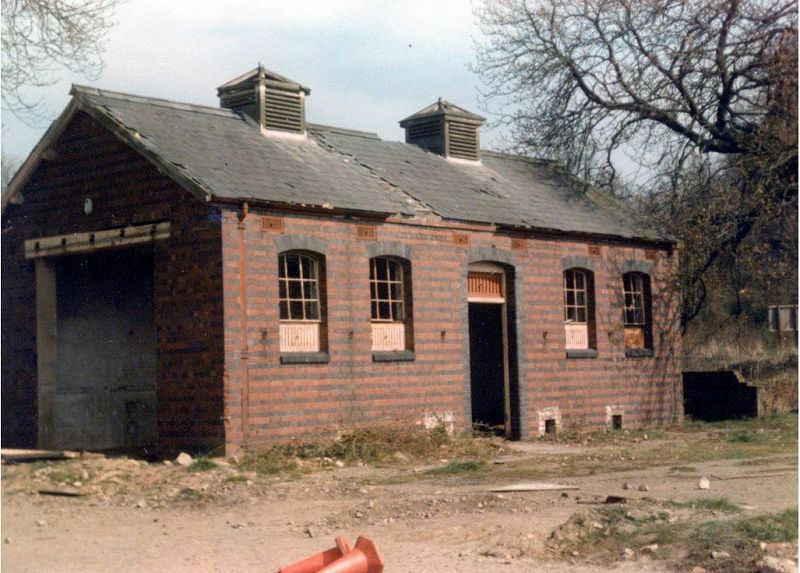 However, this is confused by the fact that (i) stables may have been retrofitted with new ventilation by the GWR, and (ii) stables were often rebuilt when no longer used for horses, and so latter day photos may confuse. For example, the latter day photos of Witney (built 1905) show windows like a Style A, but with the boxy roof vents of a Style B. However, the stable block was rebuilt to house motor lorries, and a closer look at the photos suggests to me that the windows and doors did originally have vents, but were replaced/modified (ie it is a rebuilt style B). The stable block at Minehead is more tricky, as described in the caption below. The preserved stable block at Minehead. As seen here it would seem like a Style A, but an earlier hand-drawing (not GWR) shows it with hit-and-miss vents in the windows, suggesting a Style B - except that the drawing does not show vents above the door or on the roof. Were they removed before the drawing was made (when the end doors were installed, for example), or was Minehead a hybrid? Shared under Creative Commons license. Attribution: Chris Osment/West Somerset Railway. A number of usually small, non-standard ad hoc stables, typically built during the early years, and often by independent companies. In some locations, the GWR simply hired space in a building for the local shunting horse with private individuals. Examples: Henley-in Arden, Princetown (built ca 1910), or how about Camborne! Very large stables for the major goods depots, including (i) single-story designs such as Hockley, (ii) two-story designs, rare but see Handsworth & Smethwick (and Paddington originally) and (iii) in a league of its own, Paddington Mint. The stables at Paddington Mint. Copyright Getty Images, embedding permitted. So those are my notes for now. Many thanks to all who have provided info and allowed use of photos so far. I am hoping that this will also bring new insights to light from others, as I have probably only scratched the surface.